The correct fitting, wearing and proper maintenance of dentures can have a huge impact on your life. That's why this website has been created - to connect you, the denture wearer, to the expertise of Direct Denture Makers around the world. The site also has interesting Denture BLOG Articles to read written by experienced, caring experts. This site is a world first with an international directory of DENTURES Made Direct and an international denture help centre designed to answer all your questions about dentures. You will be connected to someone who has been working as a clinical dental prosthetist since 1980.FAST Reponse Assured. You will be connected to professional Direct Denture Makers in Australia, Canada, USA, United Kingdom, New Zealand and Denmark who are waiting to hear from you. All are equipped with the solid technical, clinical and interpersonal skills needed to design, create, construct and modify (repair or reline) a denture to ensure optimal fit, maximum comfort and general well being. They are also registered and licenced with Dental Health Authorities. 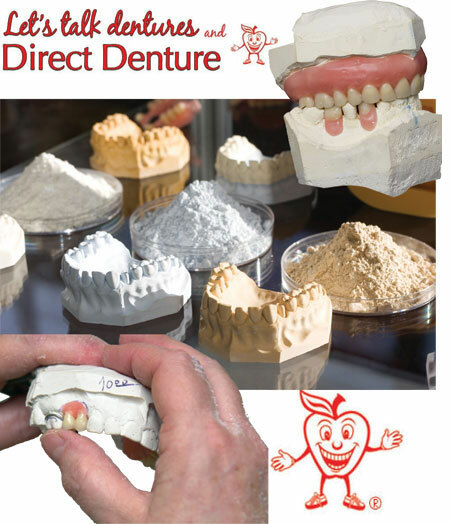 Only DIRECT DENTURE MAKERS making DENTURES DIRECT for you. Q. What is the denture manufacturer called that works and consults directly with clients about their denture needs? A. In Australia they are called dental prosthetists. In USA and Canada they are called Denturists. In the United Kingdom, Ireland and new Zealand they are called Clinical Dental Technicians. Q. Can anyone go directly to these denture professionals? A. Yes, they only make professional affordable natural looking Dentures Direct to you. The Clinical Denture maker acts as both the clinician and dental technician. She/he is therefore better able to control all aspects of the construction of the prosthesis while enabling a cost saving to the patient. Thanks Frances, I would like to say that I think its a fantastic concept and I wish you much luck in getting it well known. So many people have trouble with their dentures and just accept that that's how it is. Thanks for your suggestion about the teeth and I think that it is a brilliant idea to ask what people don't like! More power to your elbow! I shall certainly recommend the site to people, on two counts. One, to find the name of a denture maker and two, to be able to ask questions and get them satisfactorily answered, so thank you!